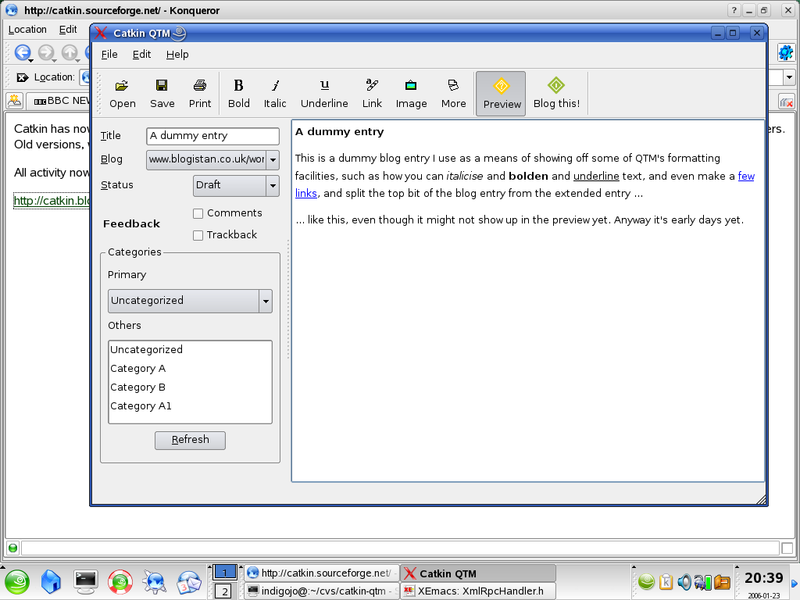 QTM is a blog management app which uses the Blogger, MetaWeblog and Movable Type APIs to submit and (in the future) edit and otherwise manage entries on a blog. Presently, however, it is possible to compose, format, preview and submit entries, in one or more categories, and edit newly submitted entries. Requires Qt 4.1 (however, due to an oversight on my part, the .gz source package requires Qt 4.2 to build; grab the source RPM if you use Qt 4.1). Issues: Qt 4.1 text editor widgets can be slow, particularly on Mac OS X. This has improved somewhat in recent versions, but may still be noticeable when composing long articles. The same widget in version 4.2 sometimes does not update properly when adding a scroll bar when the text inside starts to exceed the size of the widget. This was a Qt bug, which was fixed in Qt 4.2.3. Also, when quickposting multiple paragraphs from web browsers, only a single newline will appear between paragraphs, not two (i.e. a blank line). I may fix this in a patch release. Also, the "loading" taskbar entry will appear when starting QTM from the menu in KDE (but not in GNOME). The Mac OS X binary was built using OS X Tiger, and uses Qt 4.2, which means it requires OS X 10.3.9 or Tiger. 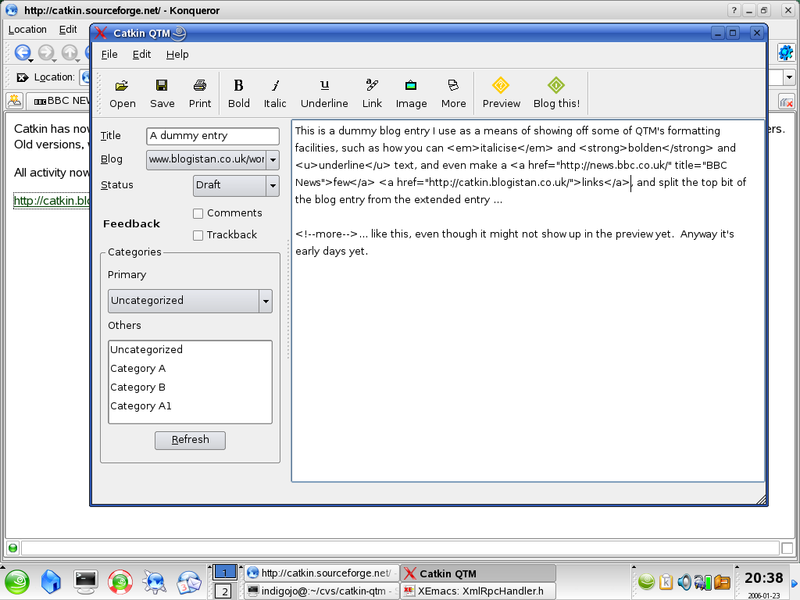 The Ubuntu Feisty binary was built using Qt 4.3, which is available in the feisty-backports repository; instructions on how to enable this are available on the Ubuntu website. I have not tried installing it on a system with only Qt 4.2. Bug fix: bug in associated hosts system, by which empty associated hosts entries were trapping the // marker in URLs (and thus causing QTM to use the wrong templates) fixed. Build system: fixed relinking behaviour; no longer relinks when QDEBUG is not set (from CMake command line). Improvement: now does base 64 conversions internally, with progress dialog, rather than the old method of using Qt's built-in converter which blocked the GUI.